Not all plants need to be in the ground. Consider container gardening. Nothing brings a deck or patio to life like a colorful composition of plants and pottery. Even the smallest, most simple container gardens can add interest. At Turks’ Greenhouses are are here to help you with your container garden project. 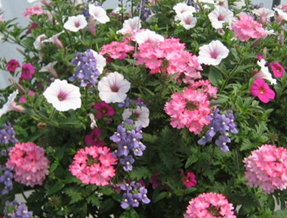 If it hanging baskets or container gardens you’re looking for, we have hundreds to choose from. Our planters range in size from a standard 10” to an impressive 16” basket with many sizes in between. When designing our planters and baskets we are always keeping in mind ease of care, plant performance, and showiness. Providing our customers with beautiful plants that are not difficult to care for is the key to our success in this department. From ready-made container gardens and hanging baskets to custom planted, we have a something that is perfect for your deck, porch or patio. Let us help you determine what will work and look beautiful in your space.